The University’s MBA program caters to students who work full-time jobs and attend classes at night, the new edition notes. Students applauded the “amazingly talented” and “approachable” faculty; its “challenging and relevant” curriculum; and a “great alumni base” that assists in career networking. Earn your degree from the prestigious B.I. Moody III College of Business Administration — no matter where you live. With our affordable MBA and bachelor’s in management degrees, you can advance your career with relevant courses and valuable connections without sacrificing time on the job. We take pride in knowing our graduates succeed in our robust and rigorous academic programs, better preparing them for the job market. UL Lafayette graduates can stand shoulder-to-shoulder with candidates from other top schools in the nation and compete on a global level. Whether you are in accounting, management, or hospitality, our programs help you find the leader within. UL Lafayette students succeed inside the classroom and soar in the business world, making the most of their education and becoming leaders among their peers. As a student in one of the country's best business schools, you can earn a degree with prestige and hone the skills you need to be a leader and a valuable employee in your career. Learn the complexities of economies, the detailed analysis of accounting, the strategies of marketing, and more. The B.I. Moody III College of Business Administration is filled with faculty members, advisory board members, and business leaders in residence who have decades of experience in their fields, and they are eager to share their knowledge with you. Each department's curricula is designed so you can learn the theories and also graduate with the skills that employers want and need, both here in Acadiana and around the world. Explore our undergraduate programs, or learn how our MBA program can help you advance in your already established career. 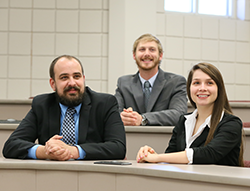 UL Lafayette's MBA program offers high-quality graduate education for students having varied educational and professional backgrounds. The program develops skills and knowledge necessary to progress in current positions, qualify for career changes, and progress in managerial and leadership positions in business and society. We now offer the option to earn your MBA 100% online!